Occipital Lobe is the rearmost lobe of each cerebral hemisphere, containing the main visual centers of the brain. It is thus involved in the recognition of faces, objects, and colors. It also helps us with orientation and direction. The brain is the primary structure of the nervous system. It’s responsible for directing and controlling multiple aspects of our bodily functions. The largest region of the brain is the cerebrum, and it’s the part responsible for personality, thinking, and sensory interpretation. Multiple lobes exist in the cerebrum, and these lobes have specific functions as it relates to the senses. As a result, any damage caused to the occipital lobe can lead to impaired or even loss of vision. It is not rare for this type of loss of vision to be accompanied by a patient’s inability to recognize places they should know. The name derives from the overlying occipital bone, which is named from the Latin ob, behind, and caput, the head. Bilateral lesions of the occipital lobe can lead to cortical blindness. One of the most important parts of occipitial lobe is the primary visual cortex, a region of the brain that receives input from the retina of the eye. This is where the mind interprets color and other important aspects of vision. The lateral geniculate body’s structures take in optic information from retinal sensors in each eye, sending raw information to each visual cortex. Lingula receives information from the contralateral inferior retina to gather information about the field of vision. 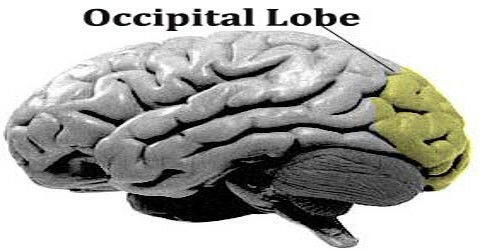 The occipital lobe contains different areas pertaining to visual communication. One area is where visual images of language are received (the visual receiving area) and another is where it is interpreted (visual association area). 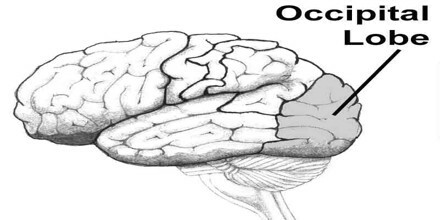 Occipital Lobe is defined as the part of the cerebral cortex that lies underneath the occipital bone. The lobes rest on the tentorium cerebelli, a process of dura mater that separates the cerebrum from the cerebellum. They are structurally isolated in their respective cerebral hemispheres by the separation of the cerebral fissure. At the front edge of the occipital are several lateral occipital gyri, which are separated by lateral occipital sulcus. A significant functional aspect of the occipital lobe is that it contains the primary visual cortex. The first functional area is the primary visual cortex. It contains a low-level description of the local orientation, spatial-frequency and color properties within small receptive fields. Primary visual cortex projects to the occipital areas of the ventral stream, and the occipital areas of the dorsal stream – visual area V3, visual area MT (V5), and the dorsomedial area (DM). 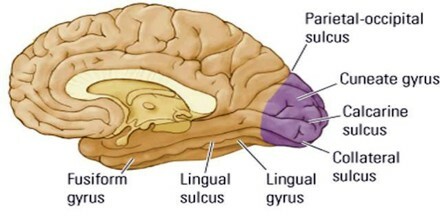 Cells on the posterior aspect of the occipital lobes’ gray matter are arranged as a spatial map of the retinal field. Functional neuroimaging reveals similar patterns of response in cortical tissue of the lobes when the retinal fields are exposed to a strong pattern.